We use a custom made soft washing system comprised of multiple solution tanks and “low pressure” pumps to clean without pressures. 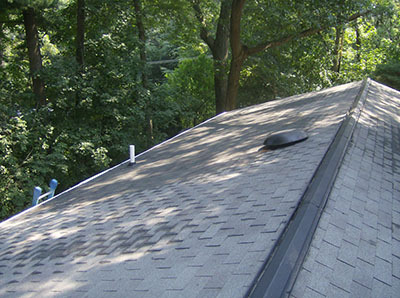 Most homeowner’s insurance policies forbid high pressure cleaning of any roofing materials. There are no pressure washers used in our soft washing rigs. Our cleaning solutions are comprised of mildew-cides, algae-cides, soaps, & surfactants. These solutions are mixed on-site and to the specific needs of the surface to be cleaned. First, the solutions are applied thoroughly to the surfaces targeted and given time to kill the mold, mildew, algae and fungus deep at its roots. Then, we let natural weather conditions of wind and rain safely remove all traces of dirt, mildew, mold and debris. We take great care of all plants and landscaping by thoroughly wetting them down and or covering them with plastic when necessary. Many companies claim to soft wash surfaces. Make sure the company you choose has the experience & proper equipment to do the job safely. I was considering that I might need to replace my shingles until Tom asked me if I’d like a roof wash quote. After explaining the gentle and safe procedure, he removed every trace of ugly black streaking and moss from my roof. It truly looks brand new again.